An acquaintance of mine had a Yorkshire terrier who had given birth to four lovely puppies. Before handing them over to their new owners, she wanted some nice images to remember them by. It was quite an insteresting shoot as the puppies would not hold still and with 5 dogs running around all mayhem broke loose. I noticed that they were generally calm when they were being picked up, so I decided to hang them in a fake-fur ski hat and took some images. I had wanted to take a picture of all of them hanging out together, much like laundry hanging out to dry, but was not quite sure how I was going to do it. I first tested the stability of the rope with a sand bag. 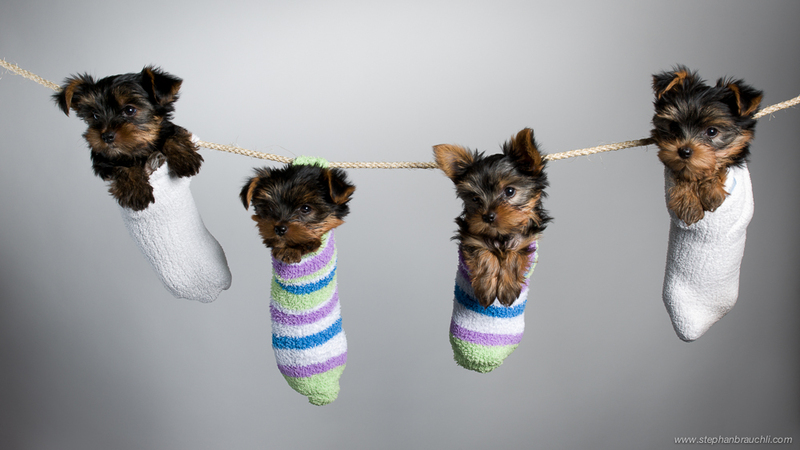 Then we carefully placed the yorkshire terrier puppies in soft socks and I attached each one to the line using strong magnets. I had placed a large bean bag under them all just in case one of them would fall. The puppies were surprisingly calm but I did not have much time to take the image. It was not easy to have them all look the same way, but when the owner picked up their mother and stood behind me, we managed some nice shots of these cute Yorkshire terrier puppies.